I have a Makerbot Replicator 2X 3D Printer. It can print in both ABS and PLA plastic filaments. So far, the only plastic I can get prints out of fairly reliably is ABS. I tried some things I saw here with some slight improvements. But it is still not worth my trouble. I am giving up printing in PLA for now, I will probably try different things every now and then when my patience is running higher. Yesterday I received the new thermocouple cable from Makerbot. 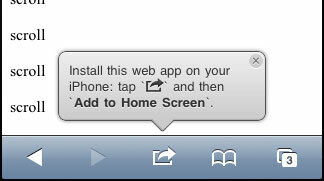 I have not installed it yet. I’ve been too busy with work and other things to really mess around with my 3D printer more. Well, yesterday was a busy day for me just immersing myself in the world of 3D printing. I want to keep this post short so I have more time to actually do more 3D printer stuff and maybe kick back on my remaining day off from work! 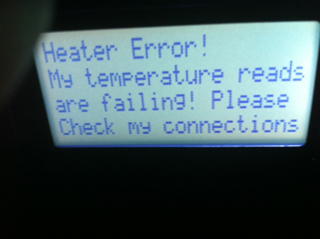 I called Makerbot about my heater error. They emailed me instructions for checking the thermocouple connections to the circuit board inside the printer. I followed the instructions (I want to do a detailed post on this later). I printed a 2nd Mr. Jaws for my nephews in Red ABS plastic. It printed nicely. A little later the error message popped up again. Grrrrr! I called Makerbot Support again and told them my woe. They are sending me a new thermocouple cable free of charge. It will take a few days to get here (for fast shipping I would have to had to pay). The thermocouple that is acting bad is for the right extruder. In the mean time, I have not actually used the left extruder yet so I decided to start messing around with that! 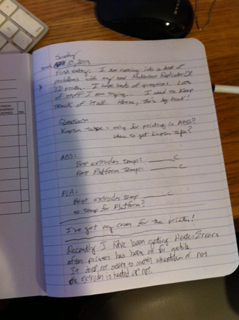 While I had tech support on the phone I had a mess of questions I wanted answered in my notebook. I asked those questions (and two or three more) and built up my knowledge base quite a bit! There is still so much to learn! BTW, I did not feel rushed by the support person (I felt more rushed by myself)! I hope to write other posts regarding the information I found out about on that call. I picked another object out on Thingiverse to print in Natural ABS plastic (white). Its called Melting Ball in a Cage (thing:62856). If you look at a picture of this thing it probably should have been called Ball in a Melting Cage! It was printed in white PLA. I have white ABS. How hard could this be? Getting the plastic to consistently come out of the extruder! The white ABS seems a bit runny. The first thing I want to do today is try the print again with a lower temp on the extruder and see if that helps. First off, I decided to keep a paper journal just for my printer. Working with this 3D printer is more than a notion! I’ve run into various problems, learned various things, there’s a lot to keep track of! 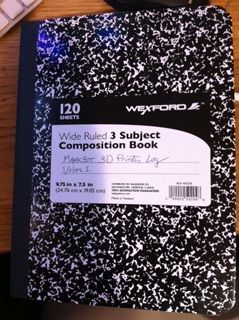 I want to put in this electronic version of a “journal” on my blog here to share what I have learned. This is the first entry. I plan on recording stuff based on reviewing my paper journal as well as trying to recall other things that I did not write down. Hopefully in the process, I will build up my body of knowledge and help others who read my blog posts on this subject. some things in this post may be slightly out of order. I did not have a paper journal at first. So some of the details may be missing. I am going to get better at this! I don’t want my 3D printer to just end up being a very expensive paper-weight! I mentioned in a previous post that I printed a comb from the SD card that came with the printer. I printed the comb in a translucent (Icicle Blue) PLA plastic filament. What next? 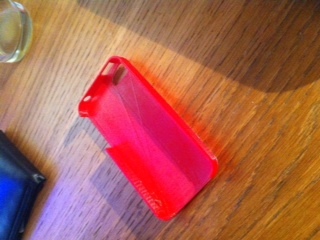 I downloaded an iPhone case of the Thingiverse site. I was not keeping track of “thing” ids at this point. This print was like day 2 of me having the printer. I started printing it in Icicle Blue PLA plastic. After doing a good deal of the case back, the extruder started clicking and the plastic was not coming out of it. I paused the printer and swapped in red ABS filament! So I was impatient! The print finished but was a bit de-laminated. Not to mention it was a bit too small to fit on my iPhone 4. Switching from PLA to ABS… Why? I did this because I read on some sites that PLA has more of a tendency to not feed into the extruder properly after the extruder has been running hot for awhile… so I switched to ABS. Maybe not the best idea, but I think its a learning experience. I decided to attempt to print this because my wife liked it. I probably was picking something too complex for me at this point. I will comment more about using the Makerware software later in another post. I was having a bear of a time getting the print to stick (even just printing a raft let alone printing the actual heart)! I learned about Kapton tape and installed a piece that came with the printer. I finally got somewhere here, but the print started really messing up about 21mm high… it was so bad I canceled the print. I was using supports (which actually may have been a mistake in this case). On my half-way decent start I had added blue painter’s tape to the build plate (I made it 2 sided). I found out later that the painter’s tape is more to be used printing in PLA. 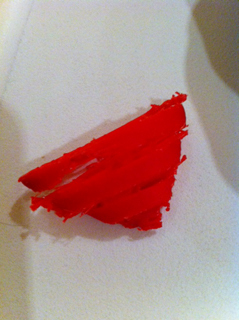 I was printing in Red ABS. I probably would have had better luck if I had leveled the build platform better. I called tech support in the afternoon… I had to leave a voice message. My message was basically about my problems getting even my raft to stick to the build platform. About 3 days later I got a call. It seemed my problem most likely had more to do with more precisely leveling the build platform. I would have liked to have talked with them longer but I had a call for my job I needed to get on. I gotta call back! At this point I did not have the cover for my printer… so I made one from a inexpensive plastic storage container that I bought at Target. I bought other plastic storage containers to store all my 3D printing stuff too! I used my improvised printer cover during my last attempt at the heartspring object. I called Makerbot about my printer cover because it was listed on the packing slip but was not included in any box that I received. The web site seemed to indicate everything had shipped. Anyway, I found out from the folks at Makerbot that it had not shipped. A couple days later I received my new cover along with an extra spool of filament. Thanks for the spool Makerbot! My wife saw a bracelet on Thingiverse that she liked (sadly I do not know the thing id), I downloaded the file and tried to print. The render took forever and I saw some things about the model that made me worry so I cancelled the print. I downloaded another bracelet model (again, I did not record the thing id). I spent some extra time leveling the build platform and the print (in red ABS) started really well! This is the first time in ABS that my raft stuck to the build plate without any problems. 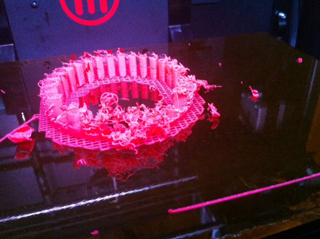 And the printing of the bracelet itself started very well. Alas, when the bracelet was about 5mm high it started to”come off the rails.” At the suggestion of my wife I let the print finish just to see what we would get. As you can see in the photo, its not something wearable! I turned the printer off and waited awhile… then turned it back on. The error went away… for awhile. Now, even when I turn the printer off for a long period of time, and then turn the printer back on I get the error right away. It is happening for the right extruder. Grrrrrr! A sheet of paper packed at the top of the box did mention that I might get the plastic cover shipped to me at another time (depending on the shipper). White plastic tie-downs where being used to hold the double extruder print head in place during shipping. What was cool was they were wrapped around red blocks of plastic that were obviously printed on a 3D printer! There was supposed to be a plastic spacer between the two gantry bars to kind of hold things steady during shipping. My printer did not have this. In other words it was missing. As expected, the printer came with an SD card which was already plugged into the printer’s SD card slot. The printer came with 2 spools of ABS plastic filament. It was not clear when I bought the printer that it would be included (which is why I had bought 2 spools separately). It took a bit of jiggering to get the print platform aligned. I decided to print the comb model (one of the models that came on the SD card). I had a bear of a time getting something to print… Turns out you really need to put this film on the printing platform called Kapton Tape. This stuff, at least the stuff that came with the printer looks more like overhead projector transparencies than tape! Interestingly enough the user manual mentions nothing about this in the setup section of the book. And this stuff did not come pre-installed in my printer! After I put this stuff in I started to get somewhere. You want to make sure that before you print that you remove any plastic goop off of the extruders (even if it is the other extruder that you are not using)! That goop may knock over what you are printing as the print head moves around! 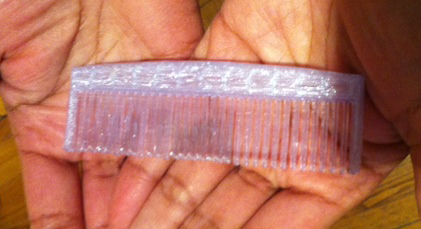 I finally was able to print a “comb.” It came out a bit warped so I don’t think it would do a good job of combing your hair! This warping problem may be due to platform not being heated warm enough. The acrylic cover has a lot to do with keeping the heat stable in the printing area so we’ll see how that helps the print quality once I get it. I can adjust the temperature of the print platform (make it higher), and perhaps I should adjust the height of the platform so it is slightly closer to the print head’s extruders. We will see. 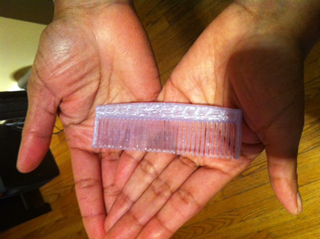 BTW, I printed the comb in PLA which should be less fussy. I am still working out the tweaks. Some final notes: some parts of the user manual are very clear, some need some help (there are two sections one after the other on loading filament… it gets confusing what is happening here). This mainly is during just the printer setup section. 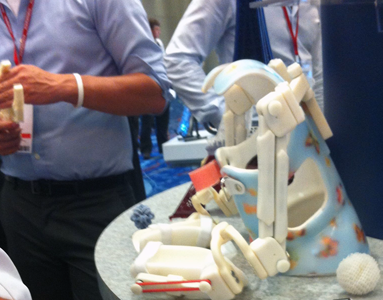 Is 2013 the Year of the 3D Printer? 3D printers have been around for a little while. Instead of printing ink or toner on paper like a 2D printer, these devices print 3D objects by taking a computer file that describes a 3D object and print them by building them one thin layer at a time. Many printers print objects in plastic. But some even print in metals! These printers used to be relegated to the use of R&D departments of companies who could afford $50,000 or more devices as large as a big refrigerator. Recently though, some small companies have been coming out with desktop 3D printers that are affordable to normal people. My first exposure to these kinds of printers (or any 3D printers at all) came from Make Magazine. They had an article about the Cupcake 3D printer kit from a company called MakerBot. Very cool stuff! Me and a buddy of mine went to like the next MakerFaire in San Mateo and there were quite a few 3D printers around busily printing different objects. There were lots of people crowded around these things. I could see why! It was mesmerizing to see a device like this making an object from scratch. 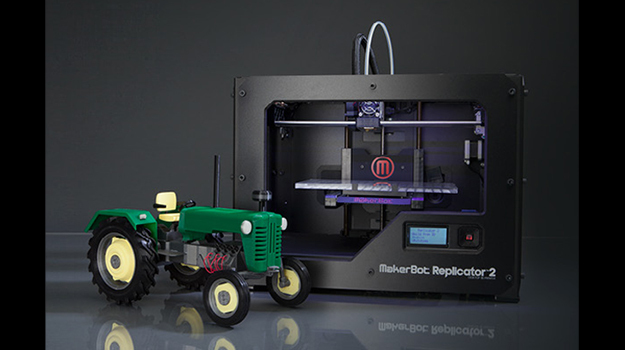 MakerBot is not the only one coming out with desktop 3D printers that people can afford. It should be very interesting what happens in this space! And yes you can do more with this thing than just print out busts of Yoda and statues of owls! I’ve even seen such things as working shower heads! 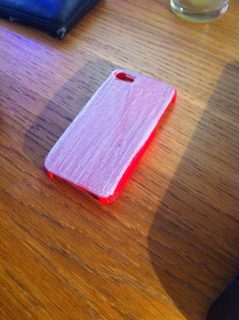 To get an idea of things one can print on a 3D printer check out Thingiverse!